freestyle bikes for freestyle motocross stunts of course. It’s big air freestyle - Spectacular stunting –wow! 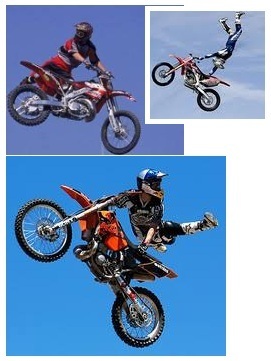 Freestyle Bikes - Interesting Things about Freestyle Motorcross Bikes and Freestyle Riders. When it comes to freestyle bikes, MX fans notice a different look and style. Handles fastened to different parts of the bike make it easier to grab something firmly while doing tricks. Trimming seat foam gives a better grip on the seat. Additional trimming of the rear fenders provide rider assistance in tricks by minimizing body interference. BMX riders had a lot of fun and FMX riders felt they could convert routines to their own bag of tricks with the required practice and adjustment to technique. A professional BMX rider, Bob Kohl was excellent at the backflip on a bicycle. In 1993, he attempted a backflip on a Honda CR80 and was successful, introducing a new challenge to other FMX riders. Making a career of stunts on bikes and freestyle motocross, Kohl continued to practice and demonstrate the extremely difficult backflip. Over 80 flips later, the trick did not go as planned. In 1995, the resulting accident did some serious damage to his body and career. Meanwhile Travis Pastrana succeeded in performing an Indian Air, another BMX move seeking achievement on freestyle bikes. Others attempted back flips on larger bikes. Mike Metzger won Freestyle Gold at Summer X Games 8 with his back-to-back backflip. Modifications on the backflip involved ‘No Footers', ‘One Handed' and ‘Heel Clickers' backflips. 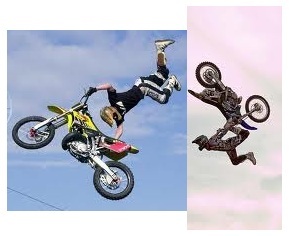 In 2009, Jeremy Lusk, an extremely skilled FMX rider, attempted a Heart Attack Indian Air Backflip during competition. The bike crashed and his head hit the landing, causing head and spinal cord injuries. FMX, like other styles of motocross, is dangerous and the glorious feeling of accomplishment achieved when an untried or previously unsuccessful trick works overcomes the danger. Extreme sports competitors recognize the danger while continuing to achieve the impossible. Freestyle mx, and how to freestyle with class. As with any extreme sport, there is some bad with the good. Safety awareness has resulted in improved safety gear for riders and modifications to the freestyle bikes. Similar to MX racers, the traditional safety equipment is a given. Other items include a neck brace to protect the neck, body armor for protecting the legs and chest, and knee and elbow pads. Keeping the front tire moving straight is the job of steering stabilizers. Suspension and tires are upgraded to withstand the demands of the trick, including takeoff and landing jarring. Moving cables so they do not interfere with boots, shortening the width of the handlebars so legs go more easily around them and adding pipes to stabilize and increase the power of freestyle bikes is essential to an FMX rider's success. Travis Pastrana won FMX Rider of the Decade for 2000 through 2010 from the International FMX community. Other awards he earned at the 2010 FMX Awards include Best American FMX Rider and Best FMX Riders Website. We all know great MX athletes go to NASCAR. A new NASCAR team owner and driver with Pastrana-Waltrip racing, Pastrana has a busy July 2011 planned. He will compete at the Summer X-Games in Los Angeles July 28 and 29. Right after that is a flight to Indianapolis for his NASCAR Nationwide Series debut. July 30 is the Kroger 200 in Number 99. The excitement continues as he heads back to LA for the Summer X-Games Rally on July 31st and the freestyle bikes competition.